BY VIEWING AND ACCESSING THIS ONLINEVIDEOCONTESTS.COM WEB SITE (the "Site") AND/OR USING ANY OF THE ONLINEVIDEOCONTESTS.COM PRODUCTS OR SERVICES AVAILABLE VIA THE SITE, YOU ("You" or "Your") REPRESENT THAT YOU HAVE READ AND UNDERSTOOD THE ENTIRE TERMS OF SERVICE (THE "Agreement") AND YOU AGREE TO ALL THE TERMS OF THIS TERMS OF SERVICE. IF YOU DO NOT CONSENT TO THIS TERMS OF SERVICE IN ITS ENTIRETY, YOUR SOLE AND EXCLUSIVE REMEDY IS TO IMMEDIATELY CEASE USE OF THIS SITE. By accessing the Site You agree to be bound by the terms of this Agreement, without modification, including all disclaimers, terms and conditions set forth in this Agreement. If You do not agree to the terms of this license, do not access the content, features or functions of this Site. ONLINEVIDEOCONTESTS.COM grants You a non-exclusive, non-transferable, royalty-free license to access the content on the site for Your own personal business purposes while visiting the Site, solely for the purposes of accessing the content, features and functions of the Site in accordance with this agreement. ONLINEVIDEOCONTESTS.COM reserves the right at any time and for any reason it deems sufficient, in its sole discretion, to revoke this license, to deny You future access to the Site, or to impose conditions on Your future access, including but not limited to requiring payment of subscription or license fees as a prerequisite for future access. This site is copyrighted by ONLINEVIDEOCONTESTS.COM . You may not copy or distribute, nor attempt to copy or distribute, the content or features of the Site. You shall not frame or link or otherwise display the pages and content of the ONLINEVIDEOCONTESTS.COM site in a manner such that although the pages and content appears to end users as though the same is being displayed from a third party uniform resource locator (URL). You will not, and will not authorize any party to, directly or indirectly, generate automated or fraudulent actions via the Site ("click-fraud"), including without limitation by using a person or automated script or computer program to generate automated or fraudulent clicks in response to any request for users of the Site to vote on content or respond to content as invited by ONLINEVIDEOCONTESTS.COM. Click-fraud and any other fraudulent actions (human or automated) that impact ratings, voting results or impressions calculated via the Site are strictly prohibited at all times. You understand that ONLINEVIDEOCONTESTS.COM makes no representations or warranties about any and all content on the Site submitted by any third party. You agree that ONLINEVIDEOCONTESTS.COM is not liable for Submissions that are provided by others. ONLINEVIDEOCONTESTS.COM has no duty to pre-screen Submissions, but we reserve the right to refuse to post or to redact Submissions at our discretion. We may, but are not obligated to, remove user accounts and Submissions that violate the terms of this Agreement. You are responsible for preventing the dissemination of Your password and You are responsible for any and all activity that happens under Your password. You will promptly notify Us at support@ONLINEVIDEOCONTESTS.COM.com if You believe the security of Your account has been compromised. You acknowledge and agree that nothing in this Agreement or its performance shall grant You any right, title, interest, or license in or to ONLINEVIDEOCONTESTS.COM's trade names, trademarks, logos, trade dress, designs, or other names, trademarks, or logos, which appear on the Site. 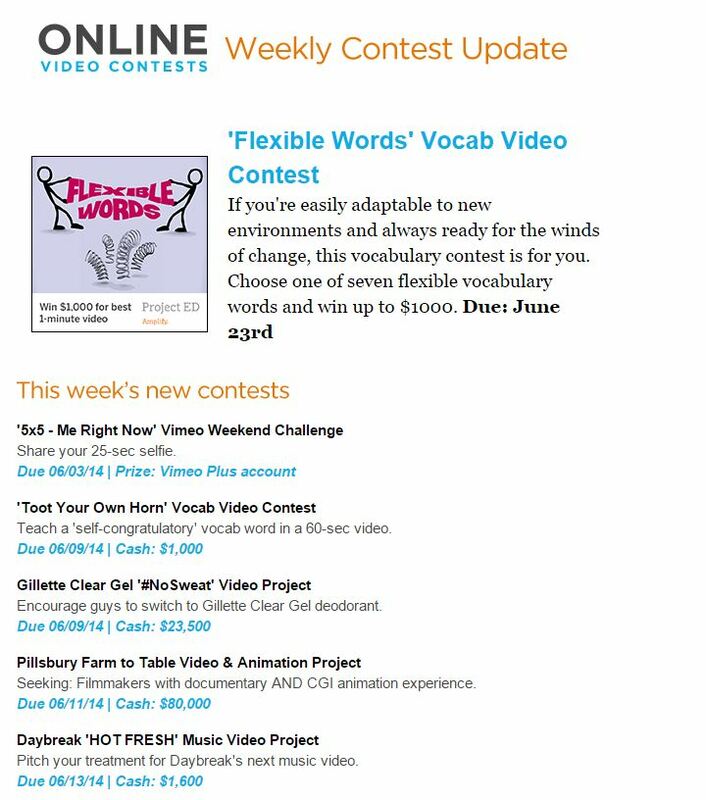 Any and all rights not expressly granted herein are reserved to ONLINEVIDEOCONTESTS.COM. Our provision of a link to any other website or location (including a link to third party online tools or resources for the creative community) is for Your convenience and does not signify Our endorsement of such other website or location or its tools, resources or contents. We have no control over, do not review, and cannot be responsible for these outside websites or their tools, resources or content. Please be aware that the terms of Terms of Service do not apply to these outside websites. Upon Our request, You agree to defend, indemnify, and hold harmless ONLINEVIDEOCONTESTS.COM, and our respective employees, contractors, officers, directors, and agents from all liabilities, claims and expenses, including attorney's fees that arise from Your use or misuse of the Site, Your breach of any provision of this Agreement, and Your Submissions provided to ONLINEVIDEOCONTESTS.COM or otherwise uploaded via the Site. ONLINEVIDEOCONTESTS.COM reserves the right, at our own expense, to assume the exclusive defense and control of any matter otherwise subject to indemnification by You, in which event You will cooperate with us in asserting any available defenses. CONTENT, FEATURES AND FUNCTIONS ARE PROVIDED ON AN "AS IS," "AS AVAILABLE" BASIS, AND ONLINEVIDEOCONTESTS.COM MAKES NO REPRESENTATIONS AS TO THE SUITABILITY OF THE SITE, ITS CONTENTS, FEATURES OR FUNCTIONS, FOR ANY PURPOSE. ONLINEVIDEOCONTESTS.COM DOES NOT WARRANT THAT THE CONTENT, FEATURES AND FUNCTIONS AVAILABLE ON THE SITE WILL MEET YOUR REQUIREMENTS, OR THAT ACCESS TO THE SITE WILL BE UNINTERRUPTED OR ERROR FREE. ONLINEVIDEOCONTESTS.COM DOES NOT WARRANT THAT ITS HARDWARE OR SOFTWARE OR ANY PORTION THEREOF WILL BE FULLY PROTECTED AGAINST MALFUNCTIONS OR SECURITY BREACHES. YOU ACKNOWLEDGE AND AGREE THAT NEITHER ONLINEVIDEOCONTESTS.COM NOR ANY REQUESTER MAKE ANY PROMISE OR GUARANTEE THAT YOU WILL OBTAIN OR RECEIVE ANY MINIMUM REVENUE OR PROFITS AS A RESULT OF THIS AGREEMENT OR YOUR SUBMISSIONS, AND ONLINEVIDEOCONTESTS.COM SHALL HAVE NO OBLIGATION TO PAY YOU ANY AMOUNTS UNDER THIS AGREEMENT, ANY NO REQUESTER SHALL HAVE ANY OBLIGATION TO PAY YOU ANY AMOUNTS UNDER THIS AGREEMENT OR IN RESPONSE TO A SUBMISSION EXCEPT AS EXPRESSLY SET FORTH IN THE RELEVANT RFB AND ONLY FOR SUBMISSIONS SELECTED IN RESPONSE TO SUCH RELEVANT RFB PER ITS TERMS. YOU AGREE TO WAIVE ANY AND ALL CLAIMS YOU MAY HAVE AGAINST ONLINEVIDEOCONTESTS.COM AND ANY REQUESTER ARISING FROM YOUR SUBMISSIONS TO AN RFB, INCLUDING WITHOUT LIMITATION ANY CLAIMS ARISING FROM YOUR SUBMISSION FAILING TO BE SELECTED AFTER HAVING BEEN SUBMITTED IN RESPONSE TO AN RFB. YOU ACKNOWLEDGE AND AGREE THAT ONLINEVIDEOCONTESTS.COM AND ALL REQUESTERS HAVE NO OBLIGATION WHATSOEVER TO SELECT YOUR SUBMISSION IN RESPONSE TO AN RFB. EXCEPT AS MAY BE OTHERWISE AGREED IN WRITING BETWEEN YOU AND ONLINEVIDEOCONTESTS.COM (WITH RESPECT TO ONLINEVIDEOCONTESTS.COM ONLY) OR A THIRD PARTY REQUESTER (WITH RESPECT TO SUCH REQUESTER ONLY), ONLINEVIDEOCONTESTS.COM AND EVERY REQUESTER DISCLAIM ALL WARRANTIES, EXPRESS OR IMPLIED, INCLUDING BUT NOT LIMITED TO ANY IMPLIED WARRANTIES OF MERCHANTABILITY, FITNESS FOR A PARTICULAR PURPOSE, NON-INFRINGEMENT, AVAILABILITY, ACCURACY, OR ARISING FROM A COURSE OF DEALING, USAGE, OR TRADE PRACTICE.SOME JURISDICTIONS DO NOT ALLOW THE EXCLUSION OR LIMITATION OF IMPLIED WARRANTIES, SO THESE LIMITATIONS MAY NOT APPLY TO YOU. LIMITATION OF LIABILITY. NEITHER ONLINEVIDEOCONTESTS.COM NOR ANY REQUESTER WILL IN ANY EVENT BE LIABLE TO YOU OR TO ANY OTHER PERSON FOR ANY DIRECT, INDIRECT, SPECIAL, INCIDENTAL, CONSEQUENTIAL, PUNITIVE, OR EXEMPLARY DAMAGES ARISING OUT OF THE USE OR INABILITY TO USE SUBMISSIONS, THE SITE, ANY RFB, OTHER ONLINEVIDEOCONTESTS.COM SERVICES OR SOFTWARE, OR FOR ANY LOSS OF USE, INTERRUPTION OF BUSINESS, LOST PROFITS, LOST DATA, OR OTHER LOSSES, EVEN IF ONLINEVIDEOCONTESTS.COM OR A RELEVANT REQUESTER HAS BEEN ADVISED OF THE POSSIBILITY OF SUCH DAMAGES. IN THE EVENT THE ABOVE LIMITATION IS NOT ENFORCEABLE IN WHOLE OR IN PART FOR ANY REASON, ONLINEVIDEOCONTESTS.COM AND ANY REQUESTER SHALL IN NO EVENT BE LIABLE ON ANY GROUND FOR MORE THAN THE GREATER OF (I) ANY SUBSCRIPTION OR LICENSE FEES YOU HAVE PAID DIRECTLY TO ONLINEVIDEOCONTESTS.COM IN THE PRECEDING THIRTY (30)-DAY PERIOD OR (II) TEN DOLLARS ($10.00 USD). ONLINEVIDEOCONTESTS.COM reserves the right to amend this Agreement at any time and without notice, and it is your responsibility to review this Agreement for any changes. Your use of the ONLINEVIDEOCONTESTS.COM Site following any amendment of this Agreement will signify your assent to and acceptance of its revised terms. This license constitutes the entire agreement between ONLINEVIDEOCONTESTS.COM and You with respect to Your rights to access and use the Site. You agree that no joint venture, partnership, employment, or agency relationship exists between You and ONLINEVIDEOCONTESTS.COM as a result of this Agreement or Your use of or access to the Site. If any provision of this Agreement is invalid or unenforceable for any reason in any jurisdiction, such provision shall be construed to have been adjusted to the minimum extent necessary to cure such invalidity or unenforceability. The invalidity or unenforceability of one or more of the provisions contained in this Agreement shall not have the effect of rendering any such provision invalid or unenforceable in any other case, circumstance or jurisdiction, or of rendering any other provisions of this Agreement invalid or unenforceable whatsoever. You may not assign, sublicense or otherwise transfer any of Your rights hereunder, nor delegate any of Your duties hereunder. ONLINEVIDEOCONTESTS.COM may freely assign, sublicense or transfer its rights or delegate its duties hereunder without notice to You. The headings in this Agreement are inserted merely for the purpose of convenience and shall not affect the meaning or interpretation of this Agreement. No waiver by ONLINEVIDEOCONTESTS.COM under this Agreement shall be valid or binding unless set forth in writing and duly executed by ONLINEVIDEOCONTESTS.COM. Any such waiver shall constitute a waiver only with respect to the specific matter described therein and shall in no way impair the rights of ONLINEVIDEOCONTESTS.COM in any other respect or at any other time. Any delay or forbearance by ONLINEVIDEOCONTESTS.COM in exercising any right hereunder shall not be deemed a waiver of that right. The Parties to this Agreement are independent contractors. Except as otherwise expressly provided herein, nothing herein creates any joint venture, partnership, agency, employment, fiduciary or other relationship between the parties, and neither party is authorized to make contracts or commitments in the name of or on behalf of the other without the other party's prior written approval. This Agreement shall be construed and enforced in accordance with the laws of the State of Maryland. Any dispute arising out of this Agreement shall be adjudicated exclusively in the state or federal courts located in Maryland, and ONLINEVIDEOCONTESTS.COM and You both consent to personal jurisdiction and venue therein.